SF Community Forum Attendees included community leaders from Booker T. Washington Community Center, National Coalition of 100 Black Women, Mothers in Charge, and the African American Arts and Cultural Complex. San Francisco - The San Francisco Cancer Initiative (SF-CAN) and the African American Tobacco Control Leadership Council (AATCLC) hosted: "What Does Menthol Have to Do with It? Everything! Tobacco and Social Injustice Community Forum." The forum with African American leaders and community members took place this month at the historic African American Arts and Culture Complex. Its purpose was to educate the broader community about the devastating impact that menthol and flavored tobacco products has had on the African American community and to empower the community to take action to deal with the number one killer of Black people. The forum, which was exciting and informative in its own right, received a big boost from friends at the Truth Initiative, who allowed a sneak preview of their latest hard-hitting national media campaign #STOPPROFILING: Tobacco is a social justice issue. The campaign, which had its official premiere at this year's Grammys, validates one of AATCLC's key messages: "the tobacco industry is the biggest and deadliest profiler of the Black community." "I came away inspired to take action," said Dr. Maxine Hickman, President of the National Coalition of 100 Black Women San Francisco Chapter. "Dr. Phillip Gardiner, Dr. Valerie Yerger, and Carol McGruder made powerful presentations with data to back it up. The most devastating truth is that for decades Blacks have been systematically and strategically targeted by tobacco companies, which have scientifically engineered tobacco products to be more addictive. You can't hear that kind of truth and not take action," added Dr. Hickman. "It's simply not true that restricting the sale of menthol cigarettes and other flavored tobacco products would lead to the criminalization of our community. Regulating these tobacco products is a key component in preventing the annual deaths of 45,000 Black people. The tobacco industry is not trying to protect our community. They are afraid of losing the 3.3 Billion dollars that Blacks spend with them every year," added, AATCLC Co-Chair, Carol McGruder. Mattie Scott, Executive Director of Healing for Our Families and Our Nation and a nationally recognized violence prevention advocate, added, "The bullet is the last thing that takes our children's lives. But the battle is on all fronts from unhealthy food, to alcohol and tobacco on just about every corner... you don't see any liquor stores in Pacific Heights, but look at our neighborhoods...death traps all around." Her presence and comments were particularly meaningful because she lost her son to gun violence. Statistics show that more than 80% of African American smokers smoke menthol-flavored cigarettes. 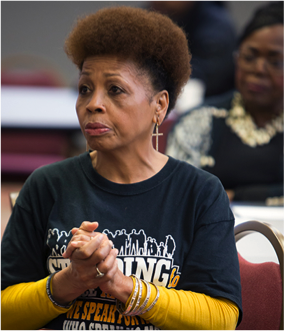 "Our research documents and exposes the truth that Big Tobacco companies strategically targeted African Americans for over fifty years to entice them to smoke menthol cigarettes," said Dr. Gardiner, co-chair of AATCLC. "The tobacco industry's shameful actions are equivalent to genocide. It's a serious community and social injustice issue. It was shameful when our federal government in 2009 chose to ban all fruity and candy flavored cigarettes, but chose to exempt menthol cigarettes. And despite all the evidence that led our government to declare that the removal of menthol cigarettes from the market place would benefit the public health, our government still has yet to act." Author, poet and spoken word artist Kwesi, "The Dreamer," presented one of his insightful poems about the challenges facing young African Americans. Kwesi's performance bolstered plans underway to host a contest for young people to create poems, spoken word and creative art exposing how the tobacco industry targeting and the resulting tobacco-related diseases kill more Blacks than officer- involved shootings, murders, AIDS, car accidents, and all other non-related cancers COMBINED. * SF CAN is a partnership between the University of California, San Francisco and the city's health systems, government and community leaders to reduce the incidence and impact of cancer in San Francisco. 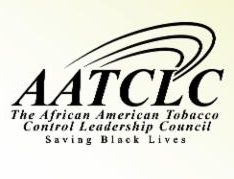 **AATCLC - The African American Tobacco Control Leadership Council (AATCLC), a nonprofit consortium of organizations dedicated to research, community collaboration and public engagement, is working to stop the preventable deaths of African Americans due to the consumption of menthol-flavored cigarettes engineered by the tobacco companies to addict Black people and others including Asian, Latino, and LGBTQ populations. The AATCLC is a proud affiliate of NAATPN, Inc.